That woman is Supreme Court Justice, Ruth Bader Ginsburg and author Debbie Levy tells her remarkable life story in I Dissent: Ruth Bader Ginsburg Makes her Mark (Simon and Schuster). The book’s target audience is 3rd and 4th graders, but will appeal to children ages 6-12. Levy, an attorney turned children’s book writer, has written many previous books including the 2010 Parents Choice Award winner, The Year of Goodbyes, which tells in verse the story of 12-year-old Jutta Salzberg, her mother, who saw the Jews of Germany stripped of their rights before her family escaped to the U.S. in 1938. To research the book, Levy read existing biographies and articles about RBG, as well as scholarly papers and articles in law reviews. She watched videos of her in action and listened to audio tapes of her arguing cases before the Supreme Court and then, as a justice, questioning attorneys who came before the court. Though she wasn’t able to schedule an interview with Ginsburg (the judge’s travel and speaking schedule was jam-packed a year in advance), she did receive permission to delve into her hundreds of boxes of papers housed at the Library of Congress. But how, Levy wondered, was she to transform the vast amount of material at hand into a picture book of only 1,200 words and a mere 40 pages? Her goal, she decided, wasn’t to tell the story of Ginsburg’s life from A to Z. “That’s available on Wikipedia,” she says. What she wanted to do was to focus on a theme, to convey the essence of her subject. 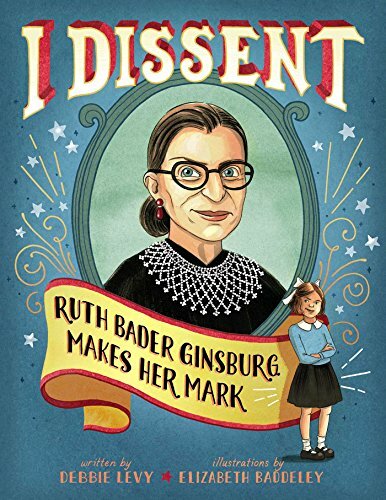 That theme— dissent—emerged (and went on to become the book’s title) when she read about Ginsburg’s childhood. From early childhood onward, the future Justice disagreed with, objected to and resisted those things she found to be unfair, Levy saw. She objected at school when left-handed children, herself among them, were expected to learn right-handed penmanship. She objected that girls had to take cooking and sewing; she wanted to join the boys in shop class to learn how to use tools. She objected to the signs she saw outside of hotels and restaurants when her family traveled: No Jews or Dogs Allowed; Whites Only. And she disagreed with the belief that a girl’s primary goal in life was to find a husband so that graduating from college or law school wasn’t essential. Enriching Levy’s first-rate text are Elizabeth Baddeley’s compelling illustrations. Levy praises the artist for portraying Ginsburg as serious and intelligent, but not as a “sourpuss,” since, she says, “it might be tempting to assume that someone who disagrees, dissents, and objects” is unpleasant. She also likes that Baddeley incorporates hand lettering into the illustrations so that young readers can see—and become familiar with—such important words as objected, disagreed, protested, dissented, resisted and persisted.